We recommend spaying all female pets. The benefits to your pet’s health and to help reduce the pet overpopulation crisis make this decision easier. It should be remembered that owners of Guide Dogs for the Blind, Hearing Dogs for Deaf People and Dogs for the Disabled routinely have their dogs spayed. 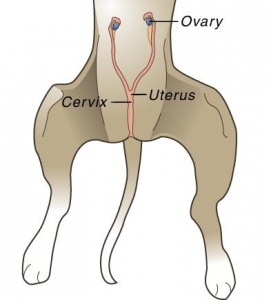 What are the advantages of spaying in the female dog? When in “heat”, the female experiences an urge to escape in order to find a mate. This is eliminated. Most of the perceived disadvantages are false. The most quoted of these are that the dog will become fat, characterless, and useless as a guard. Obesity is probably the most commonly quoted disadvantage of spaying. Obesity is the result of overfeeding. By regulating your dog’s diet and caloric intake, you can prevent obesity in neutered or intact males. Spaying is considered a major operation and requires general anesthesia. With today’s modern anesthetics and monitoring equipment, the risk of a complication is very low. It has been said that your pet has a greater chance of being injured in a car wreck than having an anesthetic or surgical complication. Your pet will be examined and pre-anesthetic blood tests are usually performed. If everything is acceptable, your pet will then be anesthetized. Most pets will have an intravenous catheter placed to administer the anesthetic and to provide fluid therapy during the surgery. After your pet is anesthetized, a breathing tube will be placed in her trachea (windpipe). This will allow us to deliver oxygen and the gas anesthetic. The surgery consists of making a small incision just below the umbilicus and removing the ovaries and uterus. Many veterinarians use absorbable sutures so that you do not have to return to have them removed. Rest and restriction of activity are the primary post-operative care you should provide. Most dogs can resume normal activity five to ten days after surgery. Until then, leash walks, no running or climbing stairs and lots of rest are the rule. I am told that letting my dog have one litter will quieten her down. There is no scientific evidence that having puppies has any calming psychological effect. Most of the perceived disadvantages are false. The most quoted of these are that the dog will become fat, characterless, and useless as a guard. Obesity is probably the most commonly quoted disadvantage of neutering. Obesity is the result of overfeeding. By regulating your dog’s diet and caloric intake, you can prevent obesity in neutered or intact males. Research reveals that neutering a pet at an early age does not cause any increased risk. Most veterinarians recommend neutering between four and six months of age. Neutering is considered a major operation and requires general anesthesia. With today’s modern anesthetics and monitoring equipment, the risk of a complication is very low. It has been said that your pet has a greater chance of being injured in a car wreck than having an anesthetic or surgical complication. Your pet will be examined and pre-anesthetic blood tests are usually performed. If everything is acceptable, your pet will then be anesthetized. Most pets will have an intravenous catheter placed to administer the anesthetic and to provide fluid therapy during the surgery. After your pet is anesthetized, a breathing tube will be placed in his trachea (windpipe). This will allow us to deliver oxygen and the gas anesthetic. 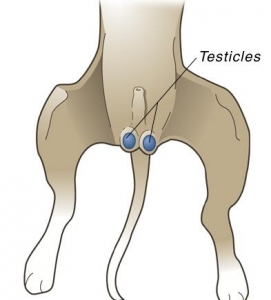 The surgery consists of making a small incision in front of the scrotum and removing the testicles. Many veterinarians use absorbable sutures so that you do not have to return to have them removed.